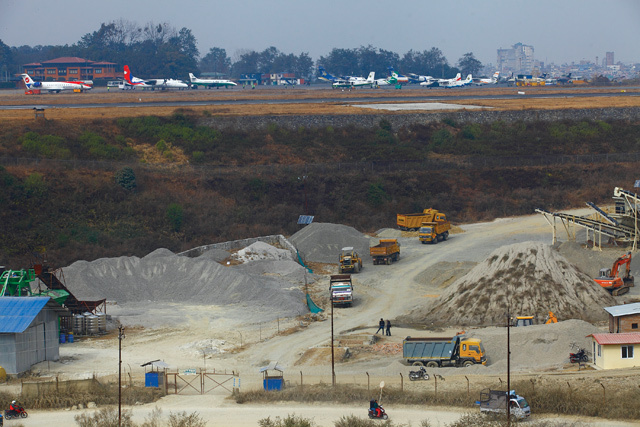 KATHMANDU, March 10 : The expansion project of Tribhuvan International Airport (TIA) is extended further to 2019 citing tardiness of the previous contractor. The previous Spanish contractor Constructora Sanjose was sent off for non- performance in December last year. After that the $92-million TIA improvement project or air transport capacity enhancement project was on hold. Last Monday, the Civil Aviation Authority of Nepal (Caan) invited bids to get the stalled project moving. It has broken up the project into three packages — runway extension, international terminal building expansion and utility works. The project plans to issue further calls for tenders for soil filling and drainage works by April-end. The duration of Package 1 is 21 months, said Babu Ram Poudel, chief of the project. The works under this package include extending the southern end of the runway by 300 metres and building a drainage system and perimeter and access roads. Packages 2 and 3 include expansion of the international terminal building, construction of a sewage treatment system and installation of a power supply system. Packages 2 and 3 will last 18 and 12 months respectively, said Poudel. Caan, the project’s executing agency, has said that the process of awarding a new contract to resume stalled upgradation work will be completed by June. The key component of the project is the soil filling works due to the difficulty of finding a quarry site and transportation routes. The earlier project had been able to supply only 600,000 cubic metres of soil out of the 2 million cubic metres required for the expansion works. The project, therefore, has planned to invite separate bids for the soil filling works. The $92-million project, jointly funded by the government ($12 million) and the Asian Development Bank ($80 million in loan and grant), was implemented on December 6, 2010, with the completion deadline set for March 2015. The project hit a snag from the start as the soil to be used as filler for the expansion of the runway was not available. Work was held up for a few days after the airport was closed when a Turkish Airlines jet crash-landed in March 2015. Subsequently, there were further delays due to the 2015 earthquakes and fuel shortages. The project’s completion deadline was first extended to 2015 and then to 2016, but after even that looked unachievable, the date was pushed back to 2018. In December 2016, Caan officially issued a ‘notice of termination’ to Constructora Sanjose for non-performance. The Spanish company had been given two deadline extensions and a number of notices to improve, but it showed no interest in moving the project forward. Subsequently, the Caan board recommended that the agreement with Sanjose be cancelled as the project had achieved only 17 percent physical progress. The air transport capacity enhancement project, which has been declared problematic, has the longest duration contract. After the completion of the project, TIA will be able to handle more than 5.85 million passengers annually and accommodate bigger aircraft.